Applying a Lens Blur effect. To add each effect it's a simple case of double clicking the one you wish to apply then adjusting the settings. If you want it to apply to the whole scene then adjust the settings on frame one, otherwise choose the key frame you want the effect to begin and end and adjust the levels of each setting accordingly. Applying a Non Photo-realistc Render (NPR). The NPR filter is quite interesting if you want your scene to look more painterly or illustration like. 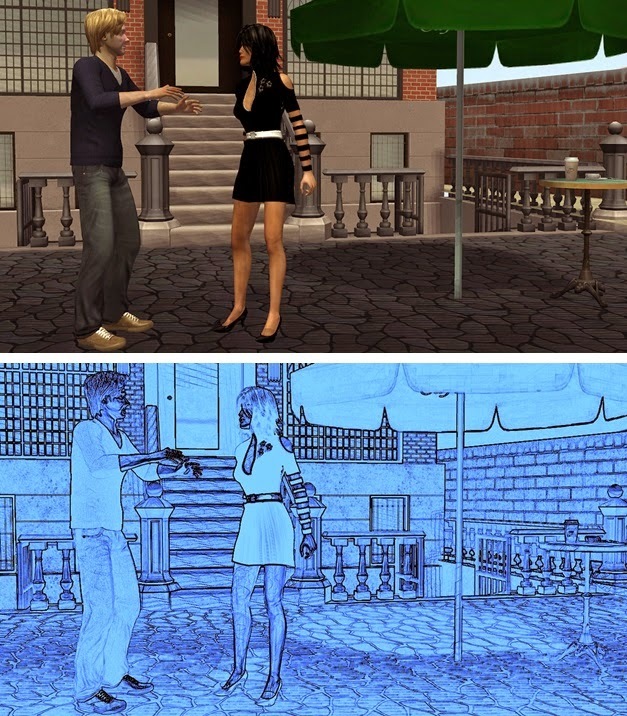 In the image on the right you can see my original scene then the scene with an NPR effect applied (followed by a color filter and color adjust). The scene itself is perhaps not overly impressive but the effects show that you could produce some very stylized video clips with iClone. The final Quick Fix Tutorial is about iClone's Toon Shader. Toon Shader is much like the NPR filter but with much more advanced settings. A Toon Shaded scene from the Video Tutorial. 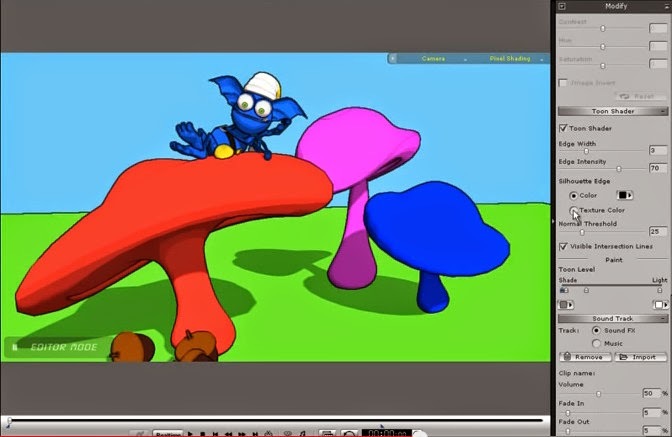 The basic idea of Toon Shader is making your 3D photo-realistic scenes look more like a 2D cartoon. Thus you get the benefits of fully posable 3D characters and 3D environments combined with the 'hand-drawn' look of 2D animation. Personally, no matter how good, you can always spot a 3D animation that has been made to look more like 2D as soon as it starts playing.Usually the animation is just too smooth for hand-drawn. However it still is a useful effect and is especially useful for combining 3D environments with actual hand drawn 2D Characters. Below is my same scene that I applied the NPR effect to but this time I've been using Toon Shader. Again it's just a case of turning Toon Shader on and then playing around with the settings. Toon Shader can really add some 2D style to your scenes. With a lot more work removing textures (as outlined in the tutorial) I could simplify my scene considerably so it looks even more 2D. However I quite like the illustrative look that I've achieved. 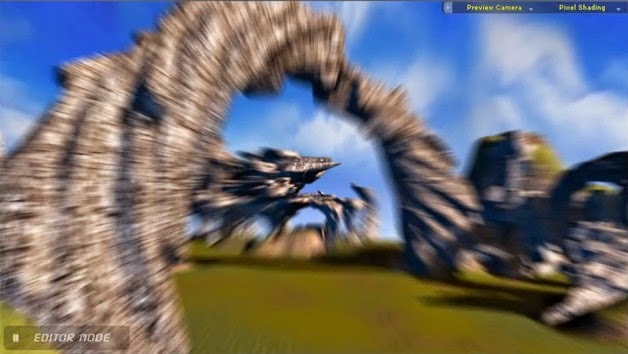 Using Toon Shader might also be a good alternative if you're not into the way iClone renders it's photo-realistic scenes which tend to feel very 'computer game' quality more than movie quality for the average iClone user. Why not go with a more 'cartoony' style instead? That concludes this series of blog posts running you through iClone5's Quick Fix Videos. I've found them to be a great introduction to iClone5 and feel I could put together a fairly reasonable animated short with just what I've learned from them. There are, of course many more video tutorials on the Quick Fix Tutorial page. If you've got this far then the rest of the tutorials should round out your knowledge. Personally I find iClone very easy to find my way around now that I know the basics. The real challenge now is in the animation - which is where it should be. Awesome, nice and fascinating. Thanks for this great creation of animation iClone. Thanks for your tutorials, they are really good. I am using https://macphun.com/snapheal for photo editing but general ideas i am taking from your guides.